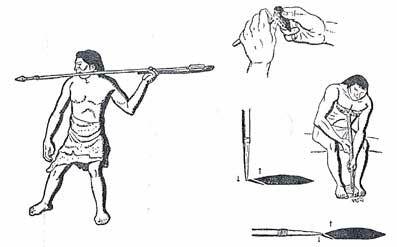 By their superior pressure flaking technique the Paleo-Indians could make points for their throwing jawelins unsurpassed in perfection. (From MacGown 1950). By this technique it was possible to flake away microscopic splinters from a flint or an obsdian and thus get a razor-sharp edge. Their weapons had accordingly a very great penetrating power.